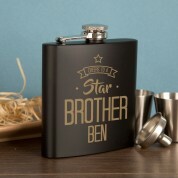 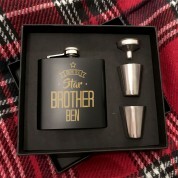 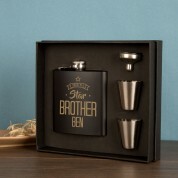 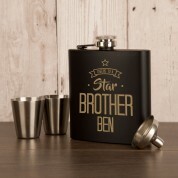 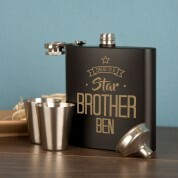 Say Cheers to a special brother with the help of our Cheers to a Star Brother hip flask gift set. 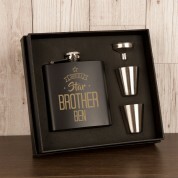 This laser engraved hip flask gift set is personalised with your chosen brother’s name on it and is presented in a stylish black presentation box with two measure cups and an easy fill funnel. 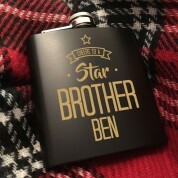 Dimensions: Approx 9cm Wide, 11cm Tall. 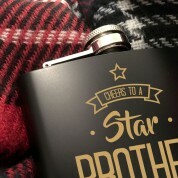 Measuring Cups: Approx 4cm tall Funnel: Approx 2.5cm tall.